Six different flavors, each gummy individually wrapped, in a resealable bag (color may vary) with satin ribbon drawstring. Five gummy candies per flavor (Purple Grape, Strawberry, Apple, Muscat (Green) Grape, Peach, Melon) - 30 gummies in all. Imported from Japan. Yes, they contain sugar, but come on, life is short! Besides, the flavor is so right, you can satisfy a craving with just a few ... Or not! Each Kasugai gummy comes individually wrapped, packed with a burst of refreshing flavor and a wonderful aroma. Japanese Gummies are one of TrueRenu's favorite treats -- Enjoy! (per gummy/bag) Calories: 15.6-16.7/470-500; Total Fat: 0g/0g; Cholesterol: 0mg/0mg; Sodium: 1.25-2.2mg/38-65mg; Total Carbohydrate (100% from sugars): 3.8-5g/115-150g; Protein: 0.3g/9g; % Daily Values based on 2,000 calorie diet: Vitamin A: 0-1.3%/0-39%; Vitamin C : 1.3-20%/40-600%; Calcium: 0-1%/0-30%; Iron: 0%/0%. Easy-open, resealable bag with individually wrapped yummy fruit gummy candies - Unwrap, Open Wide and Enjoy! Ingredients: (Ingredients vary - please see individual flavors): Sugar, corn syrup (corn starch, water), concentrated fruit juice, gelatin, oblate powder (potato, corn, soybean), D-sorbitol, citric acid, artificial flavors, artificial coloring, pectin, carnauba wax, emulsifier (glycerin fatty acid ester, soybean lecithin), Contains Milk Ingredient. Product Size: Net Weight: 150g, or about 5.3 ounces. 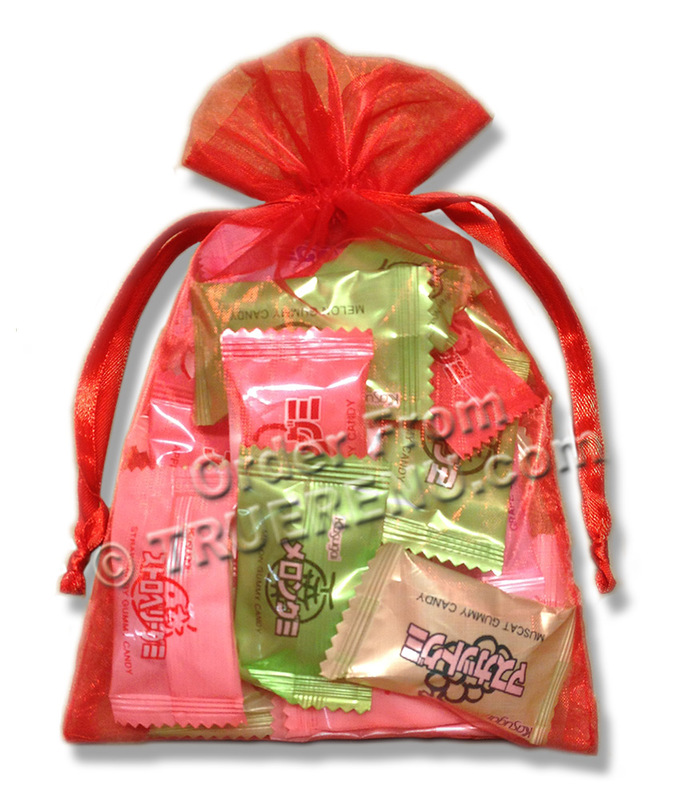 Six assorted flavors, 30 gummy candies total in a resealable bag with satin ribbon drawstrings. Enjoy the taste of real fruit! -- `Oishi` Japanese Gummies made with real fruit juice in a 5-Flavor Tropical Sample Pack - `Yummie`!!! Page displayed in: 0.2808 seconds.